Hanging arishta, an Armenian pasta, out to dry. Better with tomato sauce than laundry. 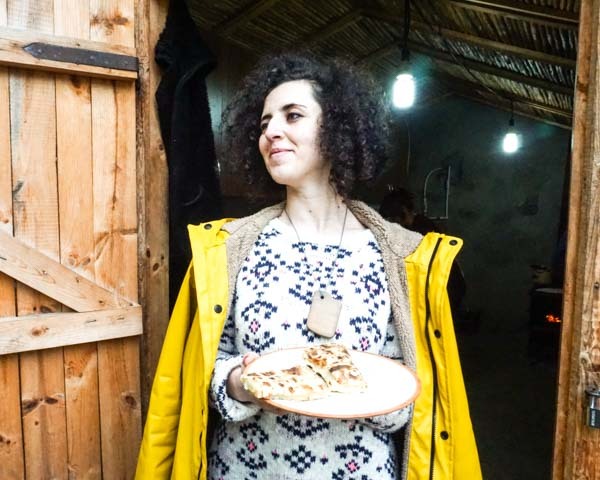 I'm back from the first research trip to Armenia for Lavash, a cookbook about Armenia's famous flatbread and the food you eat with it, with Chronicle Books. (You can read a short summary about the book project, which I'm writing with photographer John Lee and chef Ara Zada, here.) As far as bread goes, lavash is on the subtle side, and it takes time to grow on you. The first time I ate it, some of the nuance was lost on me. After a few days in Armenia, though, eating it becomes an addictive daily habit. Was it just me getting swept up in the excitement of being in a new country? I checked in with Dea, who grew up in California and now works in Yerevan, Armenia's capital city, at Tumo, a nonprofit organization that focuses on teen education on arts and tech. Did she really liked lavash? "Yes," she said, without hesitating. "I eat it at least three times a day." She couldn't imagine a day without lavash. The habit of eating lavash grows stronger the more you have the good stuff. My first lavash breakfast consisted of what we could find at the corner store. Good, but not revelatory. A few days later, we were in Argel, a village about 20 minutes outside of Yerevan, watching as a woman wearing a Los Angeles Raiders sweatshirt wielded thin sheets of dough, gluing them to the walls of the tonir, a traditional subterranean oven, with the help of a firm pillow. That morning, we ate steaming boiled potatoes wrapped in lavash with pickled beets and peppers. With a wood fire burning hot at the base of the tonir, the light, thin bread had taken on irregular blisters, the classic indication of tonir-baked lavash--the best kind of lavash. On my first days back in San Francisco, I started rationing the lavash that Marie Lou Papazian, the director of Tumo, ensured we packed in our suitcases, trying to make the bread last. (Lavash is one of the few breads that travels well.) I even started to think about how viable a lavash-focused restaurant might be. Could you center one around a tonir, baking lavash in it but also using the ancient oven to cook khorovats, Armenian-style barbecue? What if you added an Armenian wine list? Could it be A16, but the Armenian version? We didn't load up on carbs the whole trip (though potato-wrapped lavash was some sort of extreme-carb heaven that I want to return to soon). We also visited a wine incubator headed by Vahe Keushguerian, who has become the center of Armenia's small-but-growing wine renaissance. And we were on daytime Armenian TV, sandwiched in between a cooking demonstration and the horoscope reading for a lifestyle show. With Marie Lou and Tumo students Saten G. and Anna M., who documented our adventures, we also visited areas south of Yerevan, such as Goris (known for its beans--and opinionated home cooks), and the Republic of Artsakh, an ethnically Armenian country that claims it's independent. The story, though, is a little more complicated: Azerbaijan maintains that Artsakh is Nagorno Karabakh, a territory within Azerbaijan. (Last year, after years of some sort of detente, a four-day war between Artsakh/Nagorno Karabakh and Azerbaijan erupted.) Conflict out of site from where we were, we ate khorovats, harissa, and chicken with dried cherries mixed with lightly sautéed sweet onions. Artsakh's capital city, Stepanakert, is also famous in Armenia for its jingalov hats, a flatbread filled with anywhere from 10 to 21+ local herbs and greens, depending on the season (and the cook). Anyone heading to Stepanakert from Yerevan is asked by family and friends to bring back a box stacked with the herb-filled flatbread. One day in Artsakh, we ate five jingalov hats before lunch, making us pretty much jingaloved out by the end of the day. But of cource we then encountered a sweet version of jingalov hats- the jingalov dough filled with a paste of sugar and butter instead of herbs. So we had to eat that, too. There is more to download from this amazing first trip, but sometimes it's more fun to look at the pictures. So here they are: postcards from the lavash road. 20 minutes or so outside of Yerevan, Geghard Monastery feels otherworldly. We went on a Sunday during service, and the singing sounded otherworldly, too. In front of the monastery, women sell gata, a kind of bread-like sweet that can be baked in a tonir. By our trip in November, Armenia was well into apple season. On the way to Geghard, we passed by hillsides that held a patchwork of fruit orchards. On our way back into town, we stopped here and bought apples. At first I thought we were going to annoy these lavash-baking ladies by getting in the way. But they were not only gracious with information, they kept feeding us and serving us soorj, Armenian coffee. That's a box of chocolates on the table. One of the women is fixing the pillow-like thing they use to stick the lavash to the walls of the tonir with a firm whomp. A tonir is a pretty great place to keep warm on cold mornings. Here, Ara and Marie Lou warm up with soorj and the fire on our visit to Argel. You know how Game of Thrones make such a fuss about how winter is coming? In Armenia, the fuss is real. At one home we visited near Argel, a bunch of ladies bake lavash for home use. They bake enough to last them through winter. Here it's drying on the roof. Once dry, they'll stack it and put it in a spare bedroom. (It's easy to rehydrate dried lavash by sprinkling it with water and covering it for a few minutes.) Across the hall, from the lavash bedroom, one of the kids had painted "The Boy Who Lived" over the door frame. Harry Potter fans are everywhere. This restaurant in Yerevan is well worth a visit, but I can't give you its name. It doesn't have one. The owner told us he didn't need to name it because it's busy enough without advertising. Anyway, if you want to find it, ask for the tax authority building. 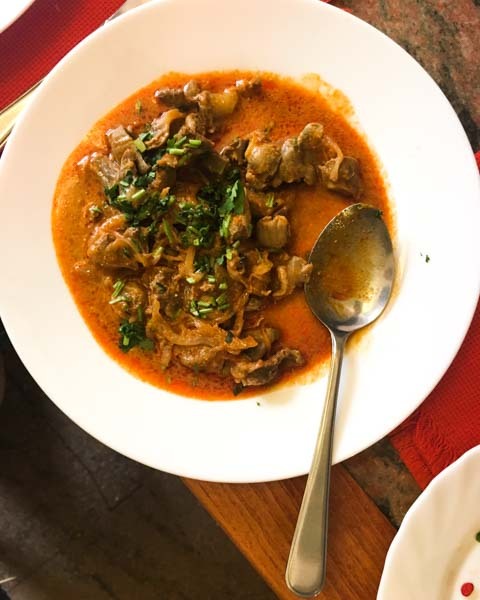 It's the restaurant next to the tax authority entrance, and it's packed with gruff-looking guys hunched over bowls of what probably reminds them of mom's cooking. In addition to the more famous G.U.M. market, Yerevan also has a more low-key village market, which is where people from the Armenian countryside show up to sell amazing produce to city slickers. And because it was apple season, it was also quince season. These smelled delightful. 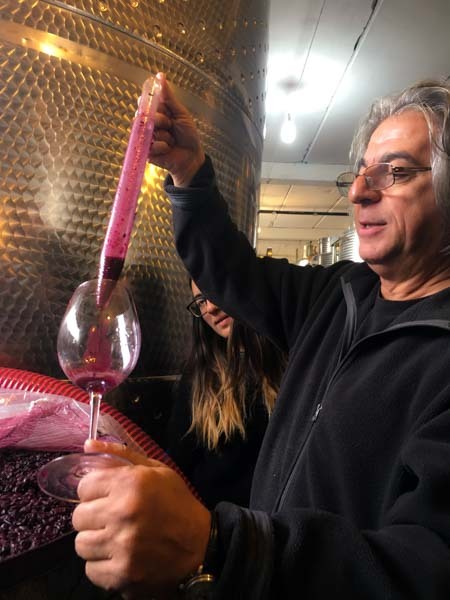 We visited Vahe Keushguarian's wine incubator, where he had us sample a vat of what he called "blue wine" -- I believe the grape was called Gaboudgeni? It looked like a blueberry smoothie. Who knows if this grape will be noble enough for anyone to take interest down the road, but these experiments are normal in in this wine frontier land. Vahes daughter, Aimee, also makes wine -- here she's sticking her head in to see what her dad's up to. Anna M., one of our Tumo student friends, at work at the central market in Stepanakert shooting pomegranates. Here's what she shot. Saten G, another one of our Tumo student friends, is holding our sweet version of jingalov hats in a small village in Artsakh. Eating here was like eating in an alpine cabin. Tea and sweet jingalov hats -- sometimes simple is better. That's it for now -- I need to finish transcribing all my notes, and we need to get our recipe list in shape so our editor to take a peak. For more, follow @lavashthebook on Instagram and @lavashthebook on Facebook.